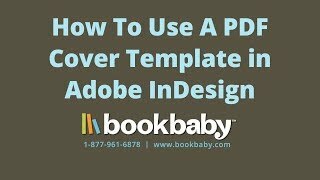 https://www.bookbaby.com/book-cover-design/ – One of our most common questions before submitting a manuscript to BookBaby is “How do I use the PDF template in InDesign?” In this tutorial, we show how to import the PDF as an image to create guides for your artwork. Keep in mind, BookBaby offers you both design services and customer support if you need further assistance. Do you dream of self-publishing your book? It’s easier than you think with BookBaby. To learn more, call us toll free at 877-961-6878 or visit https://www.bookbaby.com/book-cover-design/.